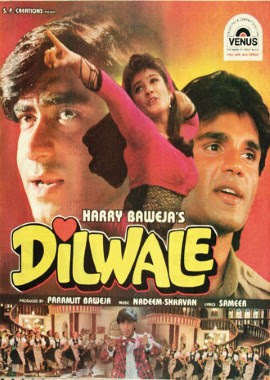 Hello Guys, We are sharing some best and romantic dialogues of forever hit movie Dilwale (1994). This is action romantic movie directed by Harry Baweja andproduced by Paramjeet Baweja. This was released in 4 Feb 1994. Ajay Devgn, Sunil Shetty & Raveena Tandon played main lead role. This was the blockbuster hit movie. Sunil Shetty played a police officer who escaped Ajay devgn and also help to meet Raveena Tandon. The movie music and songs are very famous and poplar. The music composed by Bolllywood famous music composer Nadeem-Shravan. The movie has some beautiful and romantic dialogues which are delivered by Ajay Devgn, Sunul And Raveena and others. I have collected those all best dialogues of this movie Dilwale. "Yeh aankhen, yeh chehraa, yeh noor ... Insaan ho ya pari ho tum.....kitni furasat se tumhe banaya hoga banane walon ne"
"Hum mein toh apno ne loota, gairon mein kahan dum tha..Meri kishti thi doobi wahan, jahan pani kam tha"
"Mujhe aaina na dikhao, Ismein koi pagal nazar aata hai ...yeh main nahin, Ismein sara jahan nazar aata hai"
"Mohabbat mere dost, Aag bhi lagati hai un dilon ko...Jin mein mohabbat ke chirag jalte hain"
"Yeh duniya hum mein milne nahi degi ... lekin main bhi ab iss duniyaa ko jeene nahi dunga"
"Dilwale toh bahut dekhe, lekin pyar mein joh pagal ho jayee...Aise dilwale ko aaj pehli baar dekha"
"Pyar toh usne kiya, humne to bas dillage ki"
"Yeh desh sirf do hi logon pe hasta hai ... hijhron par aur hum policewaalon par ... kyun ki nah hi woh kuch kar sakte hain, aur nah hi hum kuch kar sakte hain"
"Hum Hindustani policewaale jahannum tak us shakash ka peecha nahi chhodte ... joh iss vardi ki beizzatii karta hai"
"Main bahar dhamki dekar aaya hun ki joh aadmi pehle andar aayegaa ... main uski taangen todh dunga"
"Amir toh duniya mein nafrat hi failataa hai ... par gareeb pyar laata hai"